You need a new dentist. Perhaps you just moved to the area, or your usual dentist has retired. Deciding on a new dentist in Las Cruces is critical to your family’s oral and systemic health. Drs. Ramon and Natalie Ortiz of Painted Skies Dental Center invite you to ask questions about their highly rated dental practice. That way, you’ll understand why people trust them to care for routine and not-so-routine dental issues. So, do some research. Ask the dentist where he or she attended undergraduate and dental school. Explore the dentist’s website and online review sites (such as Healthgrades.com) for continuing education credentials and what others are saying about him or her. In addition, your dentist should belong to one or more professional associations such as the American Dental Association. These memberships keep the doctor and staff accountable to other professionals and up to date on the latest techniques in dental care. Next, find out what preventive, restorative and cosmetic services the dentist offers. A dedicated dentist such as Dr. Ramon Ortiz and Dr. Natalie Ortiz value preventive dentistry, emphasizing six-month check-ups and cleanings, sealants and fluoride treatments to prevent decay and state of the art diagnostic services such as periodontal probing, digital X-rays and oral cancer assessments. These services are essential to good oral health and systemic well-being, too. Think about your current or past dental needs, and find out if the dentist can address them. For instance, you have a teen in need of orthodontic care? 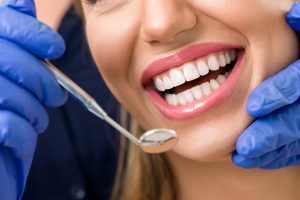 What options does the dentist offer–traditional braces, Invisalign clear braces, or is orthodontic treatment referred out? Or, inquire about specialty treatments such as TMJ (temporomandibular joint) therapy and customized athletic mouthguards. A well-rounded dentist delivers these, and he or she considers the patient’s aesthetic goals as well. Finally, your family deserves a dentist who puts the patient first. Individualized, compassionate treatment is the hallmark of Painted Skies Dental Center. Ask your prospective dentist for a tour of the office. Is the atmosphere friendly and relaxed? Are treatment rooms neat and clean? Find out what sedation and pain control options are offered. Is the dentist on-call for urgent and emergency needs? Inquire about how the staff handles insurance claims and what financing options are available. Why Not Contact Painted Skies Dental Center? Get great answers to all your questions about dental care by contacting the friendly staff at Painted Skies Dental Center. You’ll find the experience, techniques and compassion to keep you smiling.